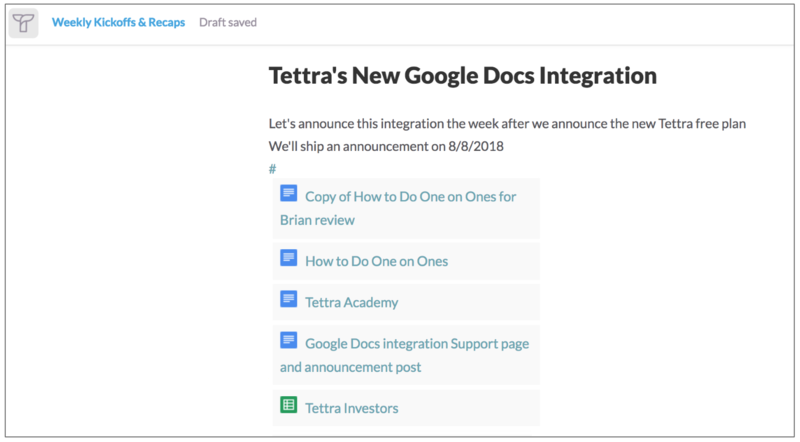 This integration lets you reference materials from Google Drive on a Tettra page without going back and forth between systems. In the top right dropdown, go to “My Settings”. 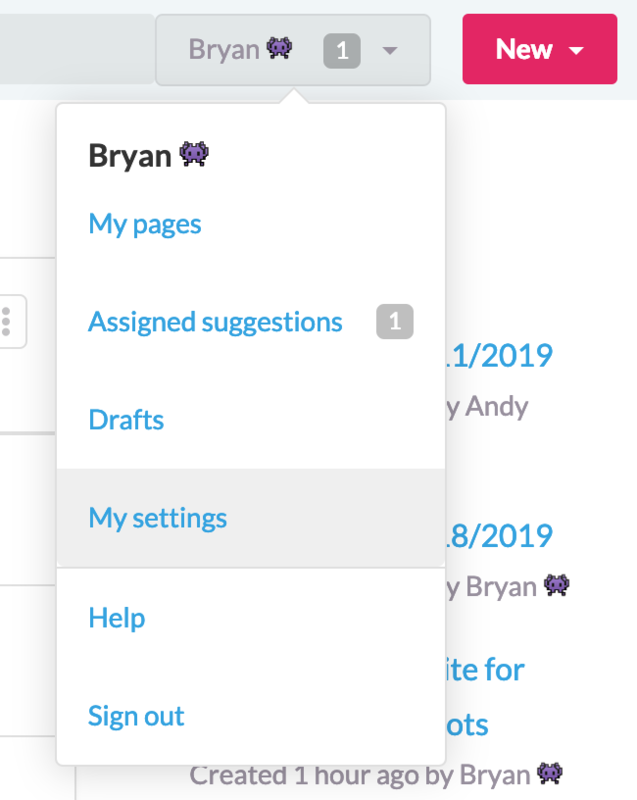 Once you're in your settings, look in the left nav for your individual user integrations. Click "Connect Google Drive". You'll need to authenticate the integration with your Google Drive login credentials. Note: you’re only authenticating your Google Drive content and content to which you have been granted access, (not the private content of others on your team). 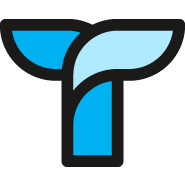 Tettra only uses the metadata of your files, (file name, type of document, and link to the file). We don’t access any content inside the files. Go to a new or existing Tettra page. Use the hash key (#), and you'll see the five most recently modified files to which you have access. Start typing the name of the file you want. When you see the result you want, select it, and the document is now referenced inline in your Tettra page. You can embed files you created as well as files other have shared with you or made public. If you have the GitHub integration enabled as well, you’ll see a combo of Google Drive and GitHub results come up. You can differentiate between Google Drive and GitHub items by the icon that appears next to the options. The icon also tells you what type of file you're referencing (doc, spreadsheet, presentation, etc). 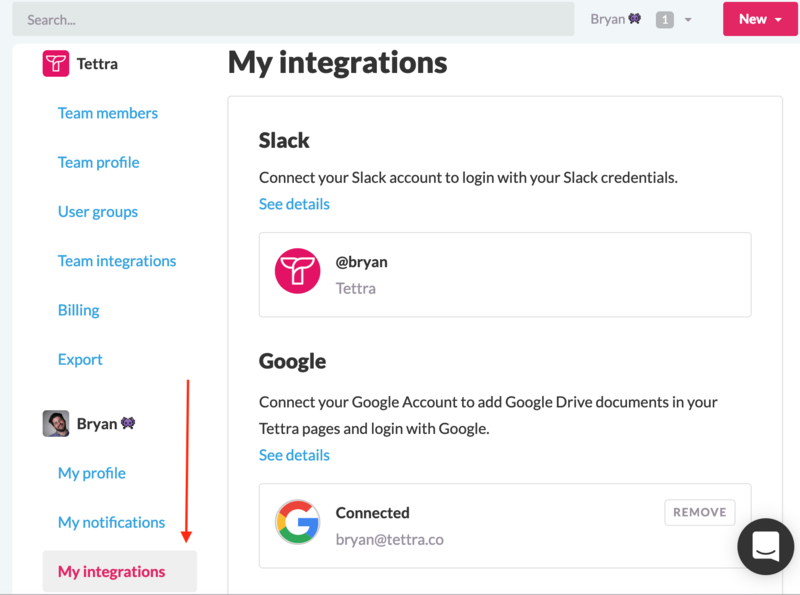 Now, when someone clicks on the file in your Tettra page, it'll open in a new tab. The reader must have access to the file in Google Drive, (ie be the account owner or be shared on the doc.) If they don’t have access, they’ll have to request access via the Google Drive page. Send us a message over chat and we'll remove the integration on Tettra's side. 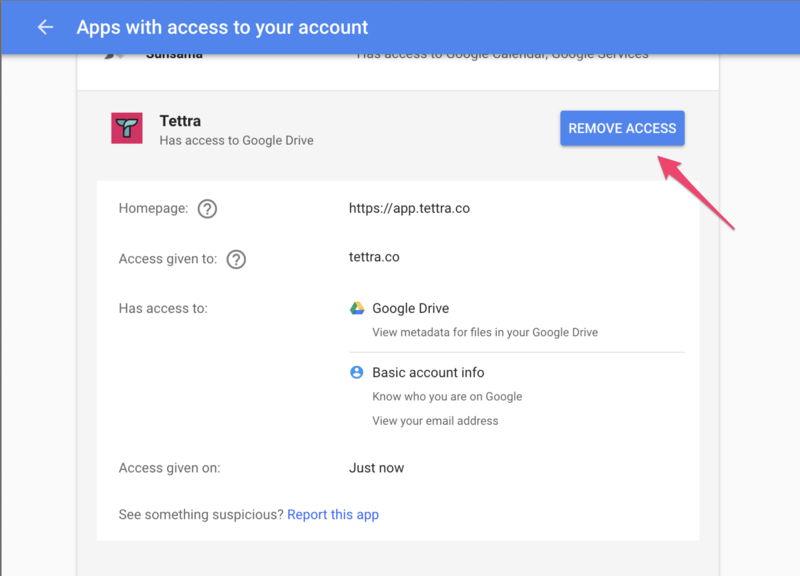 Right now, your Google Drive can only be connected to one Tettra account at a time.